Sure. It isn’t a huge fish. But it sure does have color. Hat tip to Mike Mercer. It’s his fly (Mercer’s missing link. An absolute TERROR to tie, but I did it). 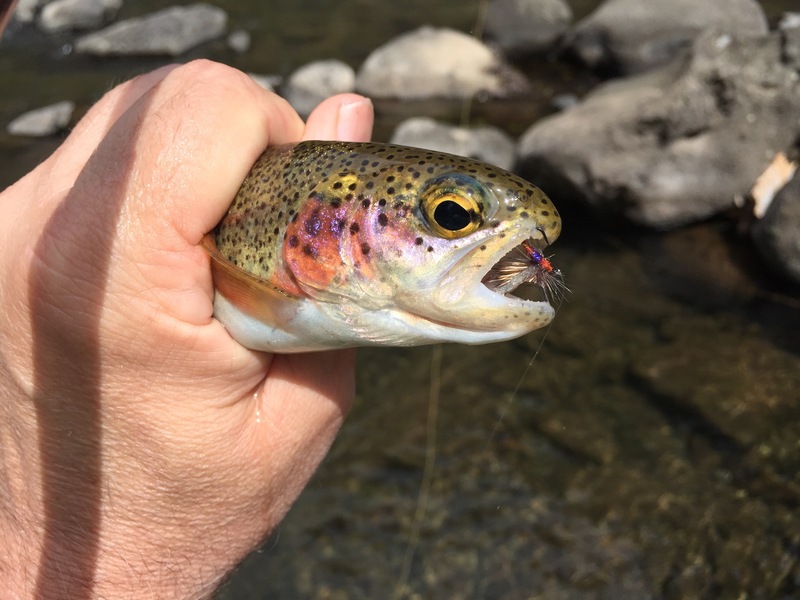 This entry was posted in Fly Tying, Uncategorized and tagged fly fishing, McCloud River, Tenkara. Bookmark the permalink. Cool looking fish! Hope you are having a great time! Not too bad. I’ve got video. Nothing but boring commentary. What would it be like if you ditched all technology while you were up there? Leave the cell phone and whatever at home. Tell your wife to expect you back in whatever number of days, and if you don’t come back to send out a search party. Just you and nature and nothing else. I did that. I almost drowned. That’s the beauty of no technology! It’s you and the great wild outdoors. Plus, how would a phone have saved you from drowning? I actually decided to post from the banks, after I had decided I was finished. Beyond that, I had it for photographic purposes. As far as indemnifying myself against a horrid, hypothermic death by drowning: I have managed to dunk every iPhone I’ve owned into the river while fishing. This isn’t necessarily because I’ve made bad decisions, but because the topography of riverbeds have suprises. I have a new iPhone 6. Even though I had it protected, I was not in the mood for stressers this time around, so I made choices far inside my normal ones in terms of traverses. BRAVO! The Missing Link looks the color of the trout it tempted. Nice. Soak it all in.